My second round of homemade pasta went much better than my first. When you use more flour and let the dough dry out, it cuts very easily in the machine. I used an apparently foolproof recipe from Smitten Kitchen that Mom pointed out to me, and I used the food processor instead of a bowl and a fork. The dough came together like magic, and I had hardly any of the tearing problems that tormented me last week. I have to get my hands on some semolina this weekend, but dusting with tons of flour seems to work well, as does throwing away the pieces that give you trouble. I refuse to break a sweat for a shriveled-up piece of dough. 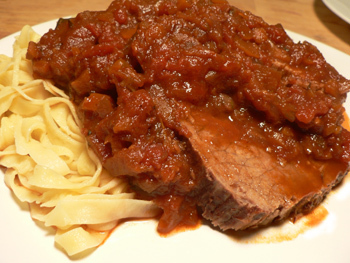 On top of the noodles here you’ll see an Italian pot roast, taken from Simply Recipes. I used eye of round for this dish, because it was on sale at FreshDirect, and I used French wine instead of Italian, because that’s my style. I didn’t have parsley or sage, but I had tons of thyme and used that instead. Otherwise I followed the recipe pretty closely. The meat looked dry toward the end of cooking, and in fact it could have been moister. But after sitting in the liquid for four hours, it was fork-tender and very flavorful. I let the sauce reduce for twenty minutes or so while the meat rested on a cutting board; it became thick and velvety. The real thrill of any meal involving homemade pasta, though, is the pasta itself. Light, flavorful, and stretchy—my fork kept pushing the roast aside to get at the noodles. This meal would have been forgettable otherwise, just another in a long series of tasty winter braises. I applaud you for going back to the pasta machine so soon! As far as the pot roast goes, eye of the round goes on sale a lot, but it is so lean that it does tend to make a dry pot roast (and stew). Let’s face it, boneless chuck is the best! i’m so impressed that you’re making fresh pasta. i can’t wait to try it. I’ve got some on-sale boneless chuck in the fridge. And no excuses. You know what we call Leland at our house? King of the Stews. Awful, I know. Totally awful. But well meant. Ha! Thanks, zp, for that flattering title. I do enjoy a good stew. Jeannie: let’s make it together! It would be much easier with two people for the feeding and pulling.